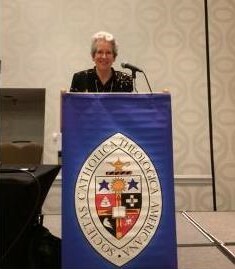 Sister Anne Clifford, Ph.D., has been awarded the prestigious Presidential Award from the College Theology Society (CTS) at its annual conference at St. Catherine University in St. Paul, Minnesota, on June 2. Sister Anne, who holds the Msgr. James A. Supple Chair in Catholic Studies at Iowa State University, is working on a third book project on creation theology and the natural sciences. Her first book, Introducing Feminist Theory, is widely used by colleges and universities. She has published more than 40 articles on feminist spirituality and theology and on creation and the natural sciences. In award presentation remarks, Sister Shannon Schrein, O.S.F., Ph.D, President of CTS, acknowledged Sister Anne’s many scholarly publications, presentations and teaching experiences. “What seems immediately apparent in her work is her love of teaching. Her (curriculum vitae) gives testimony not only to the breadth of her expertise but also to her contributions to innovative curriculum development,” Sister Shannon said. Her remarks were followed by those of Anthony J. Godzieba, Ph.D., professor at Villanova University, and long-time friend and colleague of Sister Anne. Dr. Godzieba called Sister Anne “a genuine exemplar of a CTS member” and cited two reasons. Dr. Godzieba described Sister Anne as “a talented and perceptive scholar whose work has made an important contribution to the Church and to how we see God at work in the world” and “a super-caring, supportive, nurturing, and hard-working teacher” who works tirelessly to help students learn and grow. The CTS was founded by women religious in 1954, inspired by a daring idea: college students deserve the very best in theological education. The idea translated into a professional society in which women and men, lay and religious, found common cause in their love of theology, both as scholars and teachers.